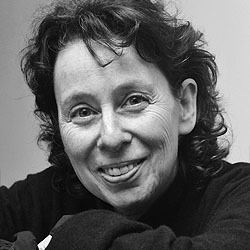 Marcy Kahan is an award-winning radio and theatre playwright and screenwriter. She was born in Montreal, educated at Oxford and in Paris and currently lives in London. Marcy’s BBC screenplay Antonia & Jane was the first television film to be given cinematic distribution by Miramax and won a Gold Plaque award for best original screenplay at the 1991 Chicago Film Festival. Her plays include: 20 Cigarettes (Soho Theatre); a stage version of Nora Ephron’s When Harry Met Sally (Theatre Royal, Haymarket); and Intimate Memoirs of An Irish Taxidermist (Perrier award, 1986 Edinburgh Festival). She has written more than 35 highly urbane plays for BBC Radio, including five series of Lunch: a Platonic romantic comedy (2015 BBC Audio Drama Award for Best Scripted Comedy); The Playwright & The Grammarian (‘wonderfully incestuous’, the Times); The Uncertainty Principle (a comedy about the mapping of the human genome); Everybody Comes to Schicklgruber’s, a comedy about Hitler’s brother, the pastry-chef (which won a silver Sony award in 1997); a sextet of plays about her hero, Noël Coward; and her very first radio play The Contemplative Life which starred Alan Rickman as a homicidal Benedictine monk. Marcy’s dramatisations for BBC Radio include Anthony Bourdain’s Kitchen Confidential; Timur Vermes’s Look Who’s Back; Jonathan Franzen’s The Corrections; P.G. Wodehouse’s Psmith in the City; Tolstoy’s War and Peace (with Mike Walker; 1998 Talkie award for best drama); Adventures of Huckleberry Finn (BBC/CBC co-production) and The Wizard of Oz. Her current projects include an original play, Oscar Wilde: The Warhol Years, for BBC R4.